The Fellowship was fortunate enough to obtain a copy of INVINCIBLE #99 from Image Comics. 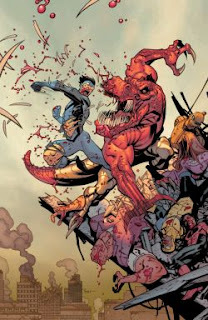 Robert Kirkman writes, and Ryan Ottley draws. Invincible has figured out Dinosaurus’ plan now, and he’s not overly happy about it. Dinosaurus has violated his trust and executed a plan which will kill countless people and reroute civilization in a direction of his choosing. So a lot of this issue is slugfest between the two of them (supers like to talk with their fists). And the rest of the supers are trying to control the catastrophe. The setup for issue 100 is now complete. It sure seems like something big is coming in #100. I’ve been away from this title for a while, I admit, but it still works. The characters are still pretty much the same, though it’s obvious that things are different. Even in this moment of action, we can still tell who gets along and who doesn’t, and how huge decisions are made by some and avoided by others. This is good writing with a clear understanding of how leadership looks and works. I love that there are so many options out there in “indie” comics, but I also love that there are a few supers options available too. There are too many supers books out there, and not enough that are as good as this one. INVINCIBLE #99 is available now at your FLCS or by order from imagecomics.com.